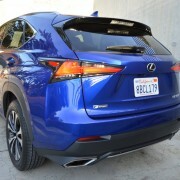 At $2,865, the “Premium F Sport Package” for the NX 300 is expensive. 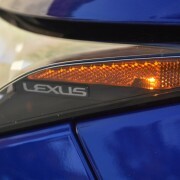 In fact it adds nearly 7 percent to the vehicle’s base price of $39,775. 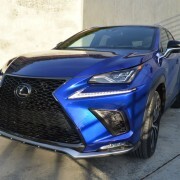 But don’t hesitate to add F Sport to your NX 300 because the long list of improvements it includes more than compensates for the price of the upgrade. 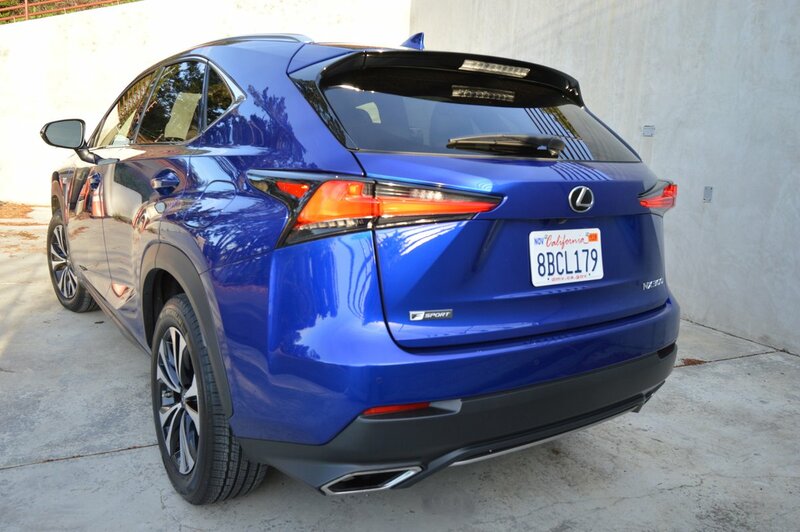 The most obvious upgrade you will notice every time you climb aboard are the incredibly supportive “F Sport NuLuxe Seats.” The support these front buckets provide in the lower back area is worth the package price alone. 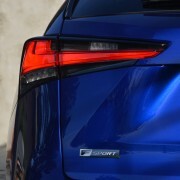 Also high on the list of F Sport additions is “Sport-Tuned Suspension.” Stiffer springs and beefier anti-roll bars work in consort with F-Sport specific, double-five spoke alloy wheels (7.5″x18″) to provide responsive handling. 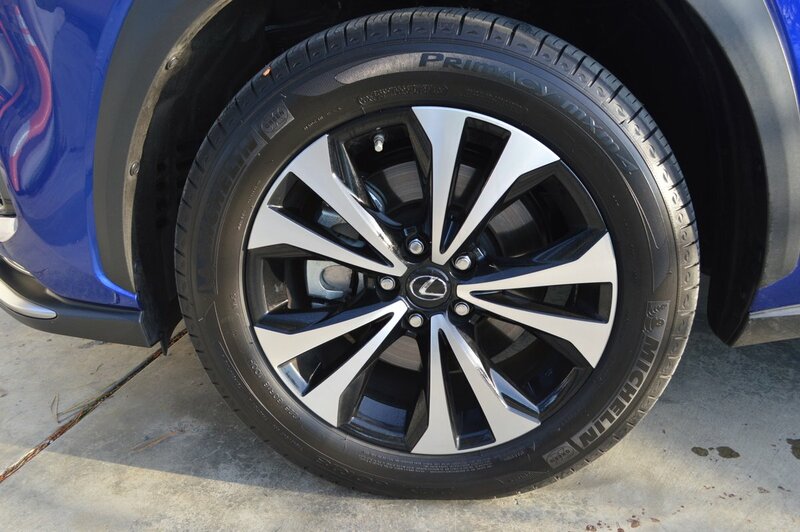 Michelin rubber (225/60R18) favors comfort and all-weather traction over ultimate dry weather grip. 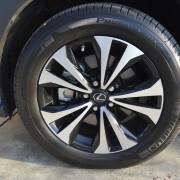 But in the prolonged wet of my week in the NX, these Primacy MXM4 tires proved ideal. 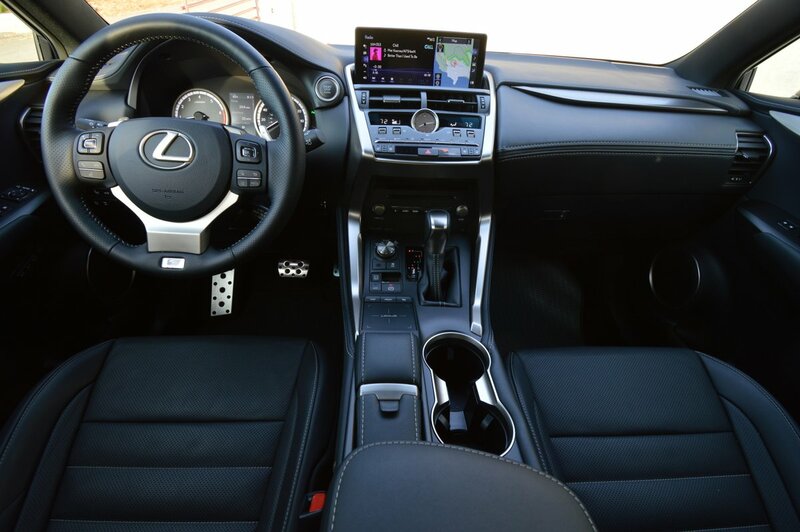 F Sport goodies embellish the interior, with a heated, fat-rimmed, perforated leather steering wheel paired with a matching console-mounted shift knob. Unlike the heated seats, which remain activated every time you restart the NX, the steering wheel heater must be re-selected at every restart. 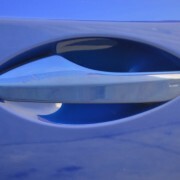 The grippy little shift knob activates a 6-speed automatic transmission. 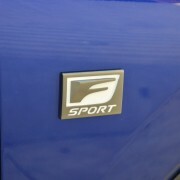 The F Sport Package adds useful shift paddles at the steering wheel. A final reason for selecting F Sport reveals itself at night, when you enjoy the extra vision afforded by fog and driving lamps which swivel with each turn of the steering wheel. 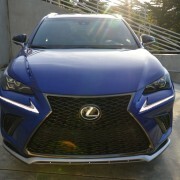 In addition to F Sport, our test NX 300 had its bottom line boosted in part from forty to fifty thousand dollars by a $1,515 “LED Headlamps with Auto High Beam & Lane Departure Mirror, and Lexus Homelink Garage Door Opener.” Another $1,800 went for a “Navigation Package and 10-Speaker Lexus Premium Sound System.” As far as LED headlamps and auto high beams are concerned, the swiveling F Sport lights would seem to render the LED option unnecessary. And since I still enjoy using paper maps, I could probably live without the pricey Navigation Package. 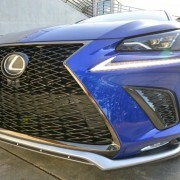 But bear in mind that you’ll just have to suffer along with the NX’ standard 8-speaker “Lexus Display Audio System.” So there – we’ve saved you $3,300 and you haven’t even left home for the Lexus dealer yet. 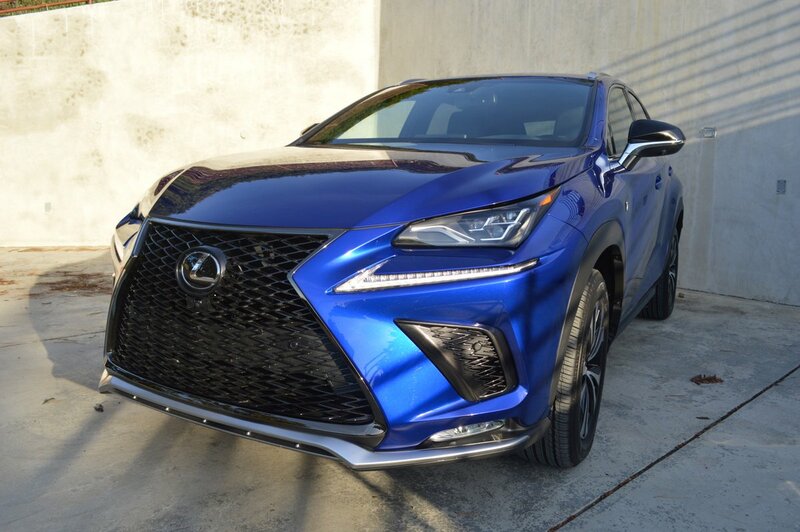 The reason you would be on your way to the dealership is that this NX is a great performing compact sport utility vehicle. 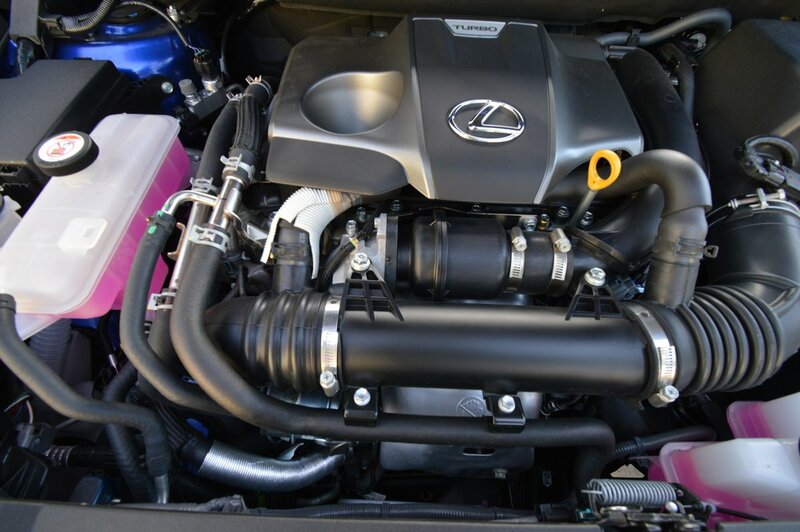 Perhaps what’s most surprising about its performance is the strength of that fuel conserving, turbocharged four under the hood. When you need power right now, the little screamer of a motor is there to assist you instantaneously. You don’t even have to flip the shift paddles or bump the floor stick to achieve now response. 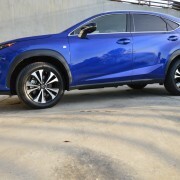 Just mat the aluminum throttle pedal and the NX jumps into thrust mode without hesitation. 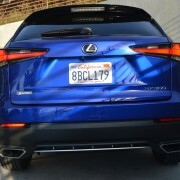 Despite the fact that this SUV weighs two tons, the 235hp engine is always up to the demands of your throttle foot. 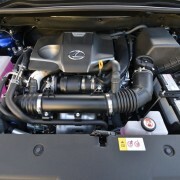 That this diminutive 2.0 liter engine registers 24MPG in overall driving is a plus you don’t expect from such a willing puller. 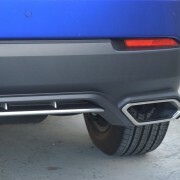 The 258lb.-ft. of torque is an added bonus for those wishing to pull a light (2,000lb.) 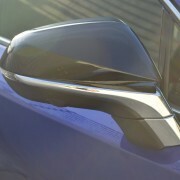 trailer with the NX. 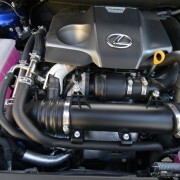 Just remember to keep the 15.9 gallon tank filled with premium fuel, which Lexus recommends for optimal performance. 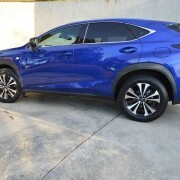 The stubby exterior design of the NX can pose a make/break stumbling block for potential buyers. 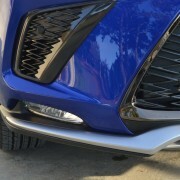 Aside from its familiar trademark Lexus spindle grill, the blistered sheet metal of the NX evokes Star Wars more than Michelangelo. 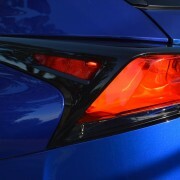 The optional ($595) Ultrasonic Blue Mica finish of our test NX just added to the Tinsel Town glamour of its muscular silhouette. But once you are ensconced in the lovely, beautifully detailed, comfortable interior, you’ll find any consternation about external appearance evaporate. 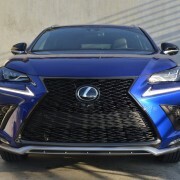 You’ll appreciate the understated precision of the contrast-stitched seats and dash, the muted elegance of the F-Sport aluminum trim inserts on doors and dash, and the overall fineness of detail work that exemplifies Lexus. 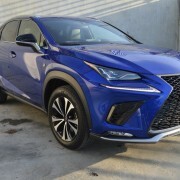 Ensconced in such luxury, you are free to revel in the fine performance of the F Sport- enhanced NX 300 without a worry about what others may think of its polarizing appearance. Because there’s every reason to admire its bulldog-like tenacity as a prime driver’s vehicle.